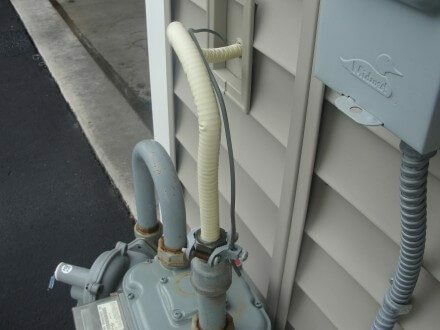 Forget Code: CSST gas lines need bonding to reduce the risk of a fire. If you own a newer home or you've recently had gas lines added to your home, there's a good possibility that Corrugated Stainless Steel Tubing, or CSST, was used. This is a relatively new material that is approved for the distribution of natural gas inside of homes. The best analogy I can think of to describe this material is that CSST is to steel gas pipes what PEX is to copper tubing, or Romex® is to rigid metal conduit. CSST needs to be bonded. The most common issue that home inspectors find with CSST is a system that hasn't been properly bonded. When CSST is installed without being properly bonded to current standards, there is an increased risk for damage to the material from a nearby lightning strike. When CSST is damaged, it can leak gas and cause an explosion and/or a fire. To the best of my knowledge, all manufacturers of CSST began implementing specific bonding requirements around 2007. Of course, proper bonding won't make CSST immune to damage from a nearby lightning strike, but it will reduce the risk of damage. What about existing installations? Building codes have something called 'grandfathering'. This means that if something was installed to code, it's still a code compliant installation today, even if the codes have changed significantly. The nice thing about being a home inspector is that we don't need to get hung up on code requirements. If something is deemed unsafe due to a change in accepted residential construction standards, our Standards of Practice require us to recommend repair. If CSST was installed to code in 2005 and the manufacturer didn't have any special requirements for bonding at the time it was installed, the installation still meets code... but that won't stop a home inspector from recommending the system be bonded to today's standards. The manufacturers of CSST have changed their installation requirements because they've learned that the old methods weren't good enough. What does proper bonding look like? 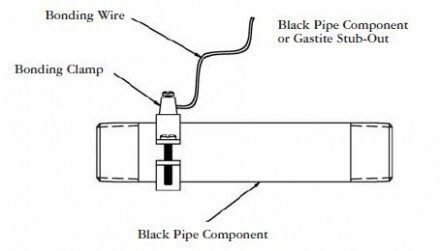 All manufacturers of CSST require the systems to be bonded in a specific manner - there needs to be a separate ground wire connected either to the rigid gas piping before the CSST, or directly to one of the CSST nuts. The diagram below shows an example of what this would look like when properly installed to today's standards. The photo below shows an example of CSST bonded at the exterior of the home, with the bonding clamp connected to the CSST nut. The video below, produced by Gastite, shows a couple examples of how to properly bond CSST. Note: some second generation versions of CSST, such as CounterStrike, do not have any additional bonding requirements. How would you know if you had CSST in your home? Look for flexible tubing with a yellow jacket that covers the ridges. It's doesn't have to be yellow - for instance, CounterStrike has a black jacket, but the majority of CSST in Minnesota has a yellow jacket. I've never seen any other color in person. This material is not to be confused with an appliance connector, which might have a yellow coating that follows the contours of the ridges. The photo below shows the two different materials. The bottom line is that if you have a home with CSST, you should make sure it's properly bonded to today's standards, regardless of whether the installation 'met code' when it was originally installed. You can't grandfather safety. Cutting Edge Solutions - this web site is filled with information related to CSST bonding requirements.